Eastside Consultants performed surveying & engineering services to develop this 40-acre parcel into a 70-lot subdivision with separate tracts for Sensitive Areas, Utilities, and Drainage. It’s only one one of numerous single-family plats designed and surveyed by our firm. Beginning with an overall boundary survey and topographic mapping, a project such as this requires consideration of both economic and environmental constraints. Click on the drawing to view a larger version. Most projects which create impervious surfaces (hard surface which either prevents or retards the entry of water into the soil as it would under natural conditions) such as a roads and buildings, must meet jurisdictional requirements for appropriate drainage. Drainage in this context refers to the collection, conveyance, containment and/or discharge of surface and storm water runoff. Typical drainage facilities that may be required for new construction include detention/retention storage, as shown in these ponds, and/or water quality treatment facilities. Detention facilities release surface and storm water runoff from the site at a slower rate than it is collected by the drainage facility system. Retention facilities simply collect and hold surface and storm water runoff with no surface outflow. Water quality treatment facilities reduce pollutants once they are already contained in surface and storm water runoff. Water quality facilities when used singly or in combination, reduce the potential for contamination of surface and/or ground waters. 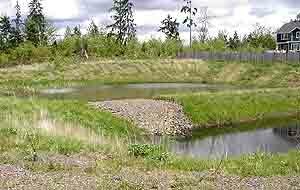 Examples of retention/detention as well as water quality facilities include, but are not limited to, open-air ponds, underground vaults, and bio-swales. Local governments, for the purposes of consistency and safety, have standardized their own requirements for most streets and roads within their jurisdiction. In addition to safety, other considerations include convenience, a pleasant appearance, proper drainage and economical maintenance. Governmental standards also provide requirements for the location and installation of utilities within rights-of-way. Engineering criterion to consider when designing an access road include, but are not limited to, road type, standard design and right-of way widths, stopping and entering sight distance, whether curbing, shoulder or ditching are allowed or required, minimum and maximum grades, turning radii within a cul-de-sac, and emergency vehicle access. Once the access road has been designed, our field crews provide the actual locations for construction, the beginning of which is shown here for a local street ending in a cul-de-sac. Land surveying is a large portion of the work done by Eastside Consultants. 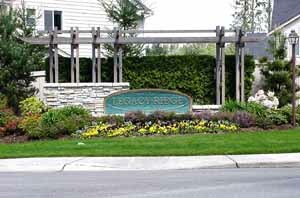 This work ranges from residential lot surveys for fence construction, to large mapping projects for planning and major subdivisions. 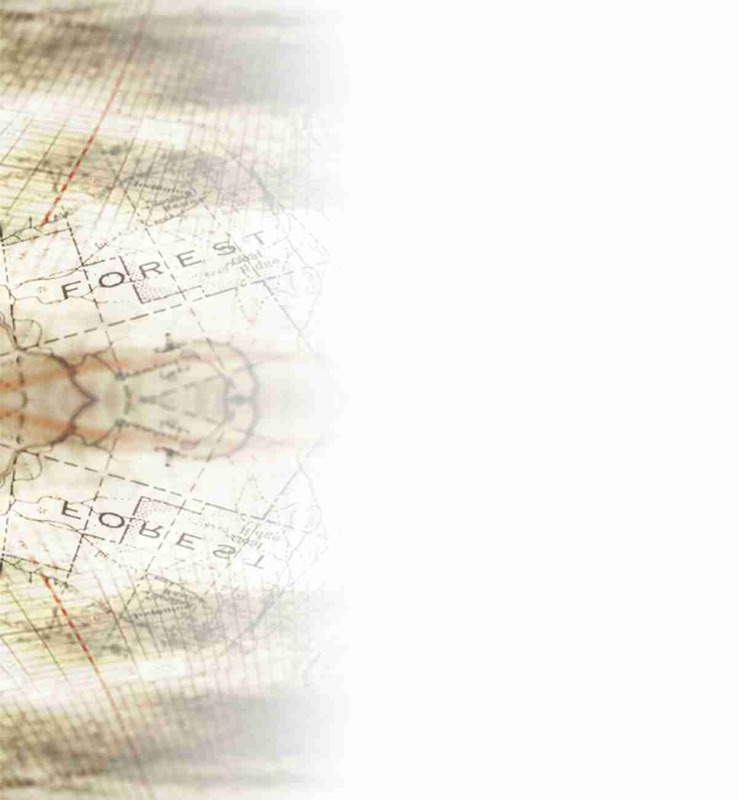 Eastside Consultants is also regularly contracted to establish boundary lines for the U.S. Forest Service, and other large landowners in heavily timbered, mountainous terrain. During the course of these surveys the original section corners, set in the 1800's, must be identified and perpetuated for future surveys. 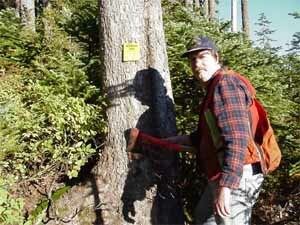 As a precaution against corners being destroyed in heavily forested areas, we will frequently "scribe" a bearing tree, as shown here, as a reference to the corner. This will enable others to re-establish the corner based on our Record of Survey. Eastside Consultants specializes in linear route surveys for projects such as pipelines and roads. This work typically involves setting up a control network over a corridor which runs for several miles. 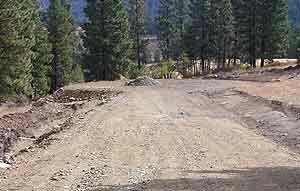 Determining the best route alternative is usually complicated by various topographic and environmental constraints, which our field crews are well equipped to handle. ©Copyright 2004 Eastside Consultants, Inc. All Rights Reserved.